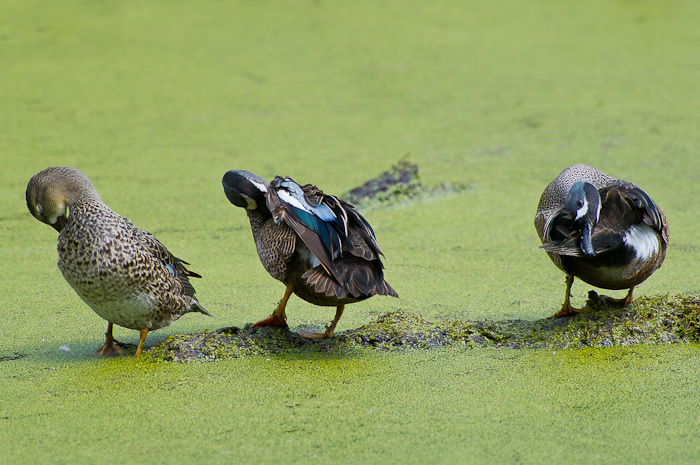 This image immediately came to mind when I read that the Weekly Photo Challenge was the word “Arranged.” I watched this trio of Blue-Winged Teal preening together for several minutes. When they first alighted on the log they scanned their surroundings, then began the ritual of cleaning feathers. It seemed as if they’d practiced this choreography many times before, and the “lead” male on the right was just a fraction ahead as if setting the rhythm of their preening. Not only were the teal arranged in harmony on this submerged log, but they were also arranging their feathers for their next flight. Interesting picture. I had no idea they were on a submerged log until I read the description. I thought they were on grass and I couldn’t figure out what the little ridge was! Yes, it was a fun shoot. I have some photos of the ducks in the water, but it does look like they’re sitting in the grass because the swamp is so dense! They are really adorable! Birds are so fun to watch! Thank you! They did seem to posing for the camera, for sure! Yes, a natural arrangement. And I love the middle duck is arranging his feathers! Thanks for letting me camp out in your blog this evening. I had a great time and tried to leave my campsite as clean as when I arrived. Thank you, Russel, for venturing into my neighborhood! I enjoyed taking a quick look at your blog today and will be back again soon. I’m glad the resident black bear didn’t bother you. Evidently, he was also camping out here last night and pulled down all of my bird feeders! Have a great day! I saw the resident black bear! I just gave him some honey and told him to skedaddle.